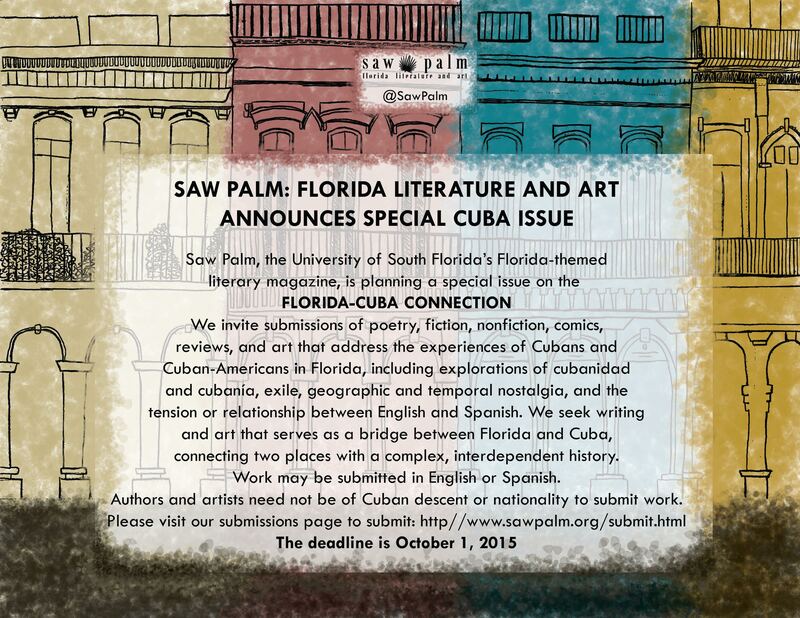 Saw Palm, the University of South Florida’s Florida-themed literary magazine, is planning a special issue on the Florida-Cuba connection. We invite submissions of poetry, fiction, nonfiction, comics, reviews, and art that address the experiences of Cubans and Cuban-Americans in Florida, including explorations of cubanidad and cubanía, exile, geographic and temporal nostalgia, and the tension or relationship between English and Spanish. We seek writing and art that serves as a bridge between Florida and Cuba, connecting two places with a complex, interdependent history. Work may be submitted in English or Spanish. Authors and artists need not be of Cuban descent or nationality to submit work. Please visit our submissions page to submit. The deadline is October 1st, 2015.